12 pack set, novel mermaid birthday party favors supplies. Magic two-color reversible sequin. Flip to other colors. Beautiful keychains for kids elder than 5, teens, adults, women. Novel birthday party favors and supplies. I'm a mermaid party decorations and gifts. Let's be mermaids. Valentines day little gifts, Easter egg basket hunt. Preschool toys. Fun Halloween giveaways, Christmas treats and gifts, classroom rewards. Great add to backpack, handbag, pencil pen case pouch. Chocking hazard. Sequin fabric may contain little parts. Not a toy for kids under 5. You'll be happy with our product, if not, service. Contact us if any problem, and we'll surely make you happy. Novel glitter mermaid tail design. Flip sequin fabric on both sides. DIY patterns. Make great gifts favors for girls. 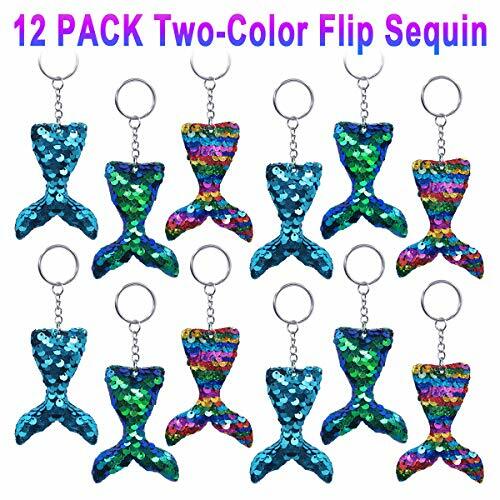 12 pack shiny sequin keychains value set. Pretty charming colors. Rainbow, pink, blue, purple. Party favors supplies. Meimaid themed party, happy birthday party, under the sea party, animal party, carnival party favors. Magic two-color reversible sequin for DIY patterns. Shine under the sun just like mermaid tail scale. Just what little girls kids love most. Halloween give aways, Christmas treats, valentines day little gifts, easter egg hunt & basket filler, classroom prizes. If you have any questions about this product by Pawliss, contact us by completing and submitting the form below. If you are looking for a specif part number, please include it with your message.